Hanson Plywood’s range of Flexible Plywood products are ideal for a variety of creative and aesthetic applications where curvature or bend are required in the final product. The product is light in weight making it easy to machine and transport. Our range encompasses plywood products comprised of sustainably harvested Ceiba, manufactured in Spain and Paricá, manufactured in Brazil. 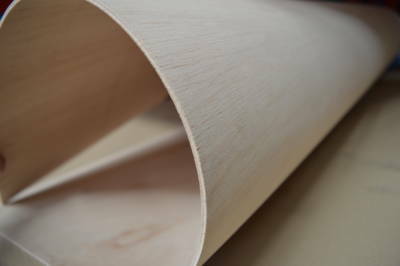 Flexible Plywood is available in both long and short gain directions. Paricá is a non-native plantation species which the Brazilian timber industry began planting over a decade ago. This was the beginning of the country’s efforts to prevent the logging of tropical hardwood species in the Amazon region, by introducing a sustainable, plantation-based alternative. The product is fully compliant with the country’s legislative IBAMA framework. Ceiba is sourced from the Ivory Coast by our manufacturer in Spain. Veneers are purchased with FSC® certification and are compliant with the Bureau Veritas OLB (Origine et Légalité du Bois) scheme, demonstrating the manufacturer’s responsibility and commitment to sustainability.